Education Qualification : Passed/Appearing(Final Year) M.Sc/ Integrated BS-MS/ BS-4 year/ BE/ B.Tech/B.Pharma/MBBS with minimum 55% marks(For SC/ST/PWD Category Only 50% Marks Required) from any Recognized University. Eligible Candidates can Submit Application at the Official Website of CSIR HRDG latest by 26th March 2018. Applicants First Logon to CSIR Hrdg Official Website. 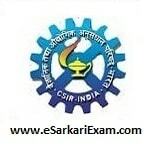 Click on Main Notification Joint CSIR UGC Test for JRF & Lectureship June 2018 Link. Register by clicking on Register Here Link.